Dezeen features our latest hospitality project in London, Farmer J’s Flagship on King William Street by Natasha Levy. 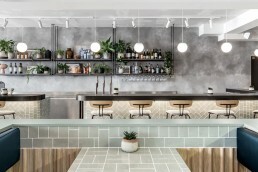 [Extract] Australian studio Biasol has combined unevenly finished concrete walls with pale green fixtures and neon signage inside this day-to-night dining spot in central London. Farmer J is situated on King William Street in the office-dense area of Monument. It is the second branch of the restaurant to open in the capital, joining an existing site in Leadenhall. Selling healthy breakfasts, lunches and dinners, the restaurant caters to city workers as well as casual diners. The “all-day-trade environment” encouraged owner Jonathan Recanti to establish a new branch that reflects the brand’s versatility and variety of service.